Everything is relative: I am sure that those of you in North America, who have been shovelling the white stuff for months, will not be in the least excited to hear that it actually snowed, but here, where winter has been horribly dank and soggy thus far, it is an exceedingly welcome change. It is the cold, crisp, crunchy days that get me through the Winter: there have been far too few of them and I confess that the sight of this in the morning made me foolishly happy. Bruce is also in a good mood. 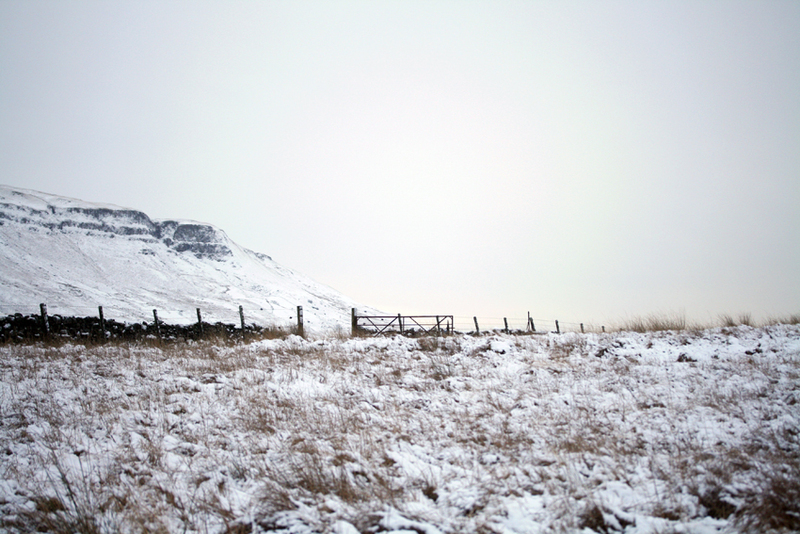 I love to walk in the snow, and we spent a good couple of hours out there this morning in the silence, with no other folk in sight. Birds seemed everywhere, immediately spotted against the landscape’s white blanket. As well as the usual neighbourhood woodpecker and buzzards I saw an osprey by the loch and a hen harrier hovering above the snow-covered fields. The birds are pairing up: this cold snap has come late, and there are already signs of Spring. I wonder how the bulbs I planted will fare. Well, its back to my desk. I have my first post-stroke driving lesson tomorrow – wish me luck! Good luck with the driving! I’m from New England and I, too, am enjoying the snow with my dogs. Love seeing the photos of Bruce in the snow. Good luck, Kate! I live in the US northeast. February has been a rather snowy month for us. I did a little cross country skiing in my yard. We went to a ice festival last night to see the carvings. It felt like Spring at 25 degrees since we’ve been living with -12 degrees F. It’s nice to have some winter events to look forward to. Winter can last a while here. At least I have sock knitting if we’re stuck at home. Hope that your lesson went well, yesterday! 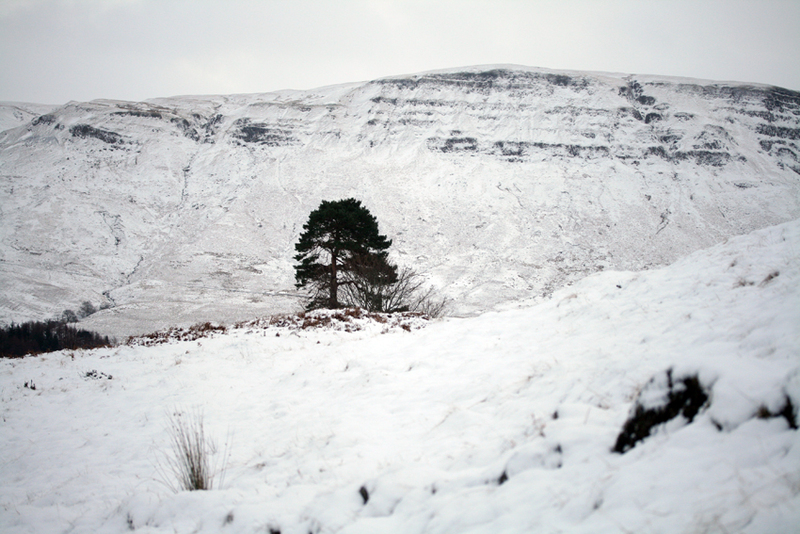 Loved your photos of Bruce, and the winterscape. I am in the winter-weary side of the equation, and seeing a snowfall with fresh eyes, and enthusiasm was very nice, thank you! If I lived in the countryside, where the white stuff is more likely to remain in its just-fallen, pristine state, I believe I would appreciate the snow as you do, Kate. However, living in an urban area of one of the Midwest states, snow all too quickly becomes a sad, dingy mess. A bright spot, though: in the disused alley behind my home is a swath of still-fluffy white that the pup and I appreciate through the fence. But most importantly, dear Kate, happy driving! Thank you so much for this post. I always follow your blog, and am officially in love with Bruce. 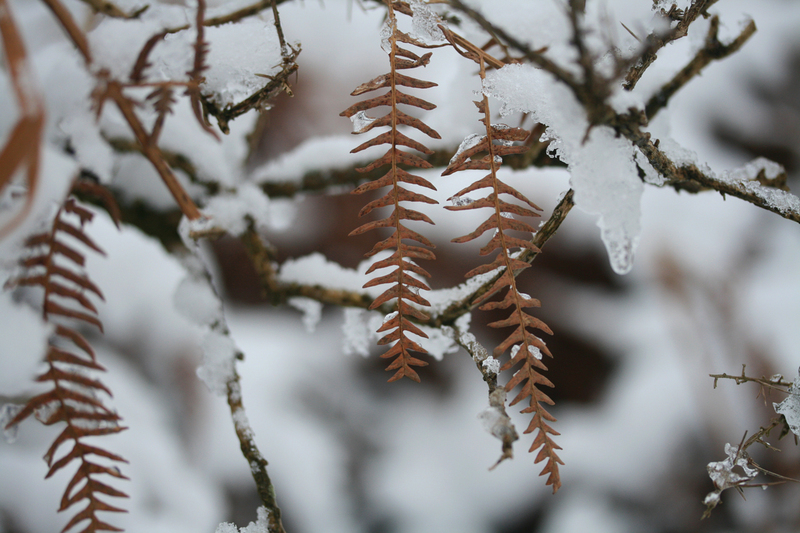 And such beautiful photos of the snow. I am a knitter as well, and aspire to one of your designs soon, but your progress post stroke is especially meaningful to me. My son was born with neurological challenges very similar to those of a person who has had a stroke, and so much of what you describe sounds so familiar. You give us so much hope with your recovery; and we saw my sons neurologist today, and he also gives us so much hope. Best of luck in your continued recovery. I live in Northwest Ohio — we would be more than pleased to send you more snow!! Good look with the driving lesson, a big positive step forward. Those of us who live in sunny Sydney but don’t like summer could do with some of that lovely snow to romp in … and a Bruce to enjoy it with. Good luck with your driving lesson! I agree with you wholeheartedly. Dark grey days have me miserable by January and today we had our first snowfall and I was out there in my woolies with my dog and we had the best walk we’ve had for months. And I feel happy! I can’t explain it but the snow cheers me up immensely. All I can say is lucky you to have fresh snow. Even though I am in Alaska our snow has moved south this year . . . Why? I am not sure no one down south likes it and I wish it would come back up north. Enjoy and best of luck driving! ADVISORY…WHICH IS IN EFFECT UNTIL 6 PM AKST THURSDAY. * WIND CHILL VALUES…TO 55 BELOW. * WINDS…NORTH WINDS 15 TO 30 MPH. Woo hoo!!! Learning to drive again. You never would have dreamt it would get this good when the horrible stroke first happened. Well done! Signs of spring in early February? Give me strength! We’ll be lucky to see anything in bloom by mid-April. As I write this, I’m getting ready to tackle the giant icicles hanging from our eaves, before they drop off an kill somebody. Best wishes with the driving. I know how much you must be looking forward to driving independence. You have come so far that re-learning how to drive will be a breeze! I wish you well! Thanks for the beautiful pictures! There’s something about the Scottish countryside that makes even a person such as myself, who is snow-weary here in Central Illinois, want to walk in the snow that refuses to leave. Good luck tomorrow, my dear. Tomorrow is the beginning of a new adventure for you. Lovely post and best of luck with your driving lessons. Good luck with the driving lesson, Kate. Only a small amount of snow here in East Wales so far. Just finished a Northmavine Hoodie for my daughter-in-law (with which she was thrilled) and my Rams & Yowes blanket always causes a lot of complimentary comments. My husband, Chris, says “Are you sure it was an osprey?” He volunteers at the Dyfi Osprey Project – http://www.dyfiospreyproject.com/ – and says the birds don’t start coming back until March. If you did see one, it really is an early bird! Enjoy the white wrapped world. I hope it last for a few days. All the very best with the driving. 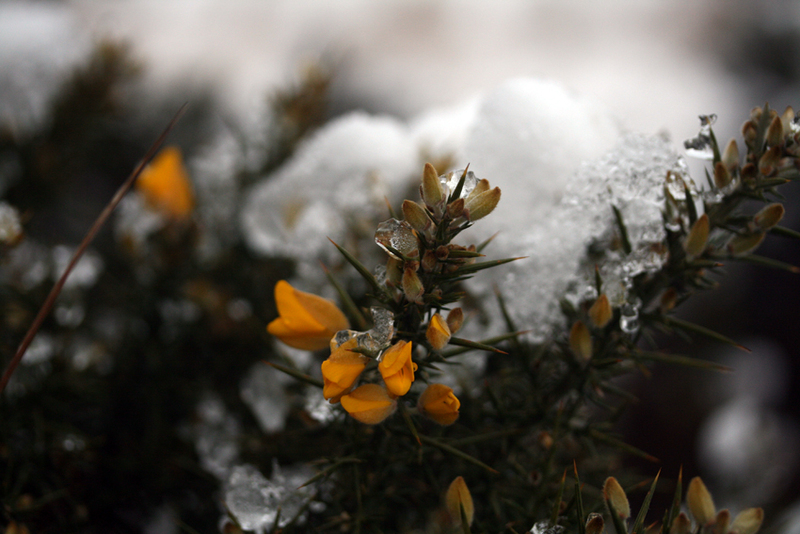 Beautiful pictures of the snow. Bruce looks wonderful too, black against all the white! Good luck with the driving lesson Kate. Thanks for sharing your lovely Brucey pics… its just wet and grey down here in Oxfordshire… but at least we are spared the floods (to date) in our little town. Enjoy the snow and good luck ! stuff underneath! She is too busy worrying about the ice. That looks like just the perfect amount of snow to be beautiful and not a hassle. Lovely photos. Hiya Bruce! Good luck with your driving lesson, Kate! Gosh, he’s a fine looking dog! 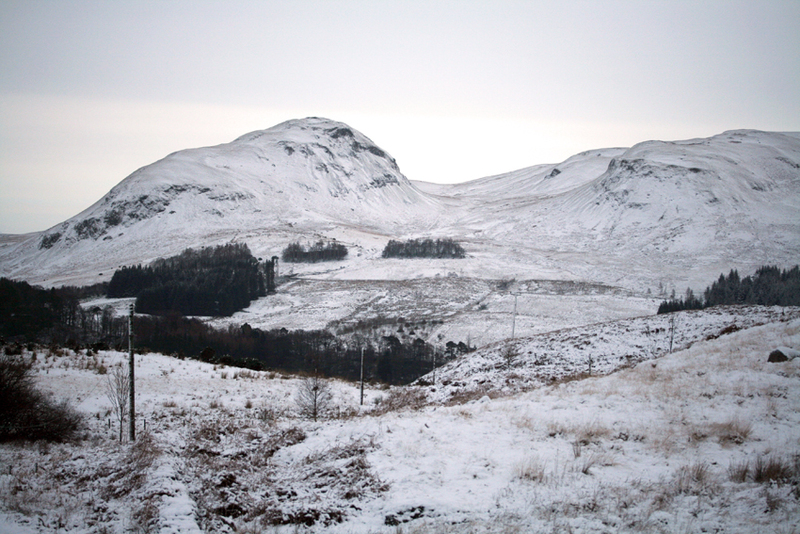 I wish for a wee bit snow – we have only had a ‘smirring’. Great that you’re going to be back on wheels. Onwards and upwards. The white stuff (though we’ve had much too much this year in the U.S. Midwest) always beats the gray days in my mind. Best of luck on your lesson. Rubs and hugs to Bruce. Toss him a wee snowball for me! Good Lucky! I love Bruce. Good luck! Hey…I saw your Gawthorpe hat pattern on Ravelry yesterday. It looks very pretty! I’m glad you got some snow, Kate. I agree that it makes winter much more bearable. Good luck with your driving lesson! It’s so wonderful that you are at the point in your recovery where you are ready to attempt getting behind the wheel again! No matter how much it snows here, I am always delighted to see it falling, so lovely. And a walk in fresh snow is always a treat. This winter opportunities for good walks in northern North America have been thin on the ground since there have too often been dangerous wind chills. Really enjoy your photos, as always! Excellent!! I love the snow too and we’re due to get about 8″ of it tomorrow! Good luck with the lesson and I’m sure you’ll do well and then be able to visit the yarn shop whenever you want!! 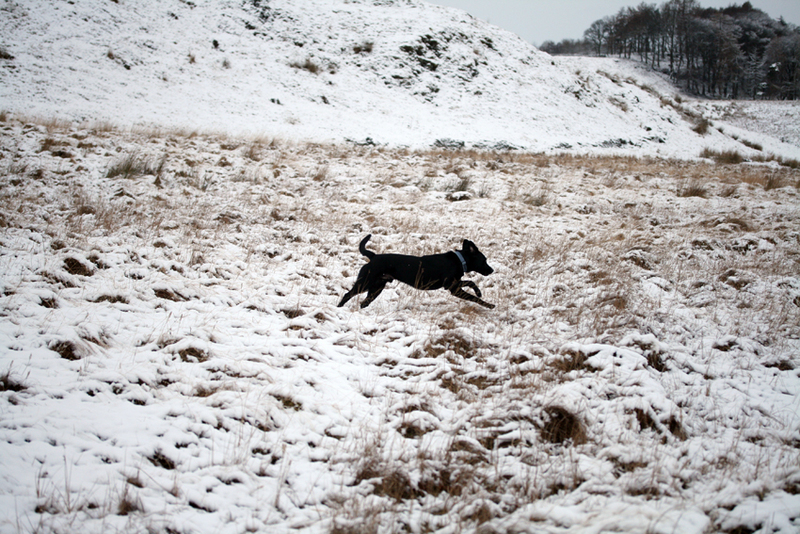 And Bruce looks wonderfully happy romping in the fresh snow! Ooh, I love fresh snow! Thank you for the pictures :) Best of luck with your driving! Good luck with your driving lesson tomorrow. Yay! And thanks for the snow pictures. They’re beautiful. Should you want more snow, I’ll be glad to send some across the Pond to you. We’re getting another 5-8″ tomorrow and 1-3″ tomorrow night. All anyone talks about is the weather and the snow. Bruce would love it here. Good luck! Will you be driving an automatic or “shift”? I love how easy driving our automatic is especially with reversing sensors…. I live in Portland Oregon and we had some snow fall too ~ a nice change from all the rain but everything grinds to a halt around here and people drive like lunatics for some reason. It was fun to see people pulling their children in sleds, skiing down the street and making snow balls to throw! 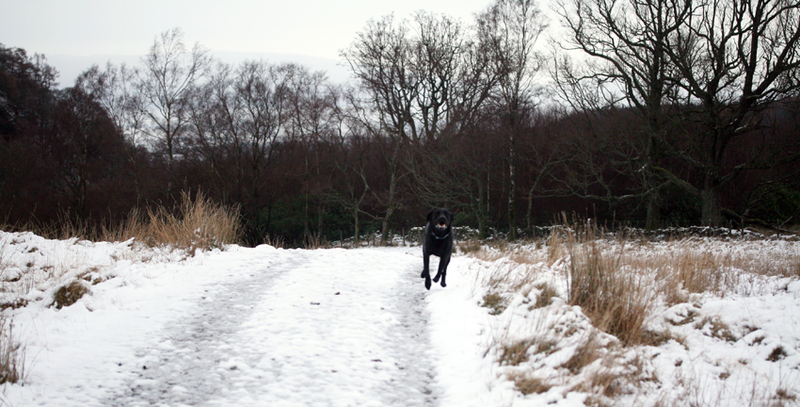 I did manage to get out a few times, the air so fresh and crisp and crunchy snow all over! It’s melting away now ~ sort of sorry to see it go. Love to see Bruce ~ he’s such a happy dog. Good luck on your driving lesson ~ have lots of fun! Bruce romping in the snow just gladdens the heart! Kia kaha Kate, go well with the driving lesson. We’ve had lots of snow this year and another storm is coming tomorrow bringing 12″. It’s okay with me — I love snow. 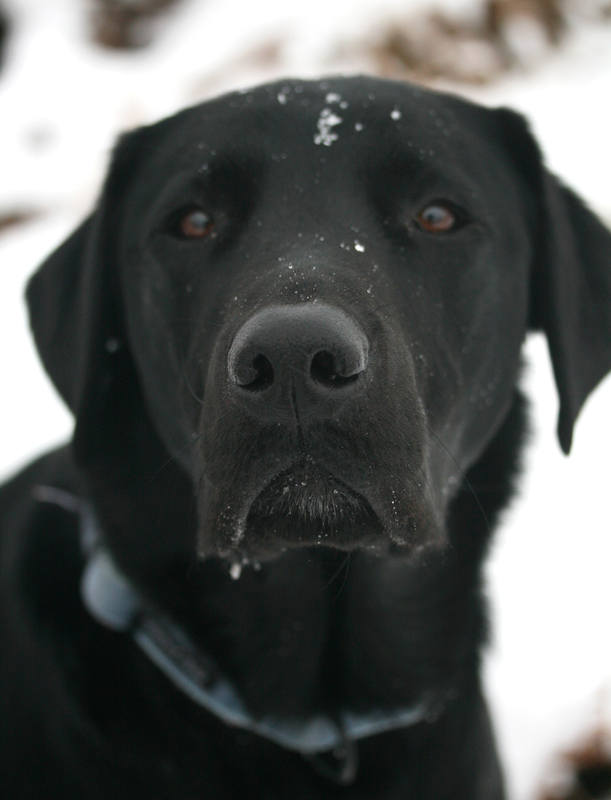 My lab Jane also loves snow, she would love Bruce too. Good luck with your driving lesson. Celebrate getting to this milestone and the perseverance it took to get there. Snow! I wish our friends in Canada would stop sharing with us! But it does let us wear all our winter woollies. 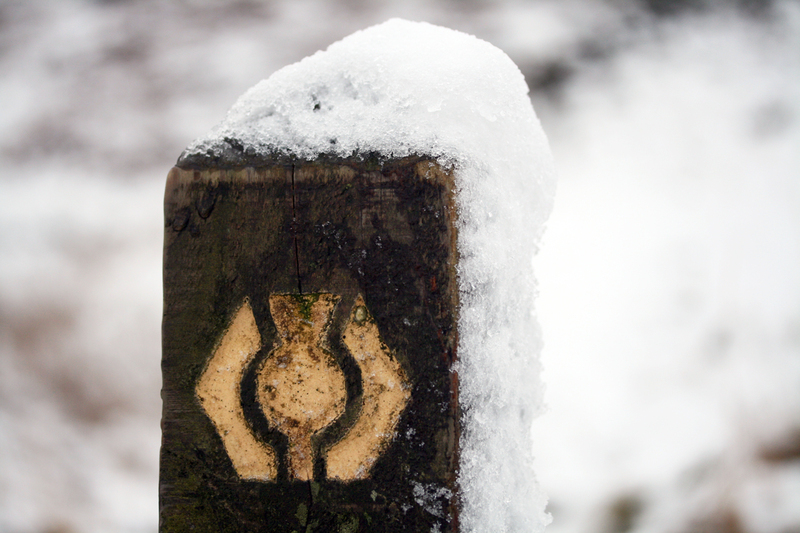 Stay warm and dry and happy trails! Love your pics and so wish I can share your enthusiasm for the white stuff and crisp temperatures. Having livestock, including Shetland Sheep, and with the coldest winter on record and that I am spending the day getting animals ready for the foot of snow we are expecting tonight….Well let’s just say Jack Frost has worn out his welcome. Very tired of frozen water, although discovered my ducks enjoy ice chips. Always can count on them for a little comedy when I need it. We have had a lot of snow, but I like snow and winter, so I’m not complaining. Especially since the last couple of winters have been really wimpy. Bruce looks like he had such a good time! I hope you do well on your drivers’ lesson. Take it easy. Good luck with the driving lesson! As someone who passed her driving test many years later than most of her peers, I know that a surprising amount of driving skill relies on muscle memory and a learned ability to pick out the important detail in a complex scene. This becomes second nature to confident drivers and they then forget that it’s a skill they had to learn. I found many experienced drivers just wouldn’t understand why I couldn’t do something easily and I found it very discouraging … but then (thanks to a patient but outspoken teacher) I learnt the skills that they had forgotten about. As you will be in the position of both learner and experienced driver, don’t be too hard on yourself if you need to re-learn things! I agree that, even with loads of snow that we have here in the US, a fresh coat is magical. I couldn’t live somewhere that didn’t get snow. I do envy your emerging spring, though! We’re at least a month and a half from that. Even when it’s been snowing for months, the moments right after the snow has fallen are the most magical and exciting. Good luck with your driving lesson! Your photographs are wonderful! Thank you for sharing. I read somewhere that Alice Walker said that horses make the landscape look more beautiful. Snow does that too, and so do dogs! how lucky with the snow : here in France we have wind, rain, wind and rain for 3 month…Good luck for your driving lesson on the snow : have fun !! Good luck for your lesson Kate. And yes snow is a glorious addition to any landscape, We have had allot here in Canada for sure but it always amazes ! Bless your heart Kate … Good luck. I live in Canada in the snow belt and this year we have inundated. I love winter but my shoulder is killing me because of how high the snow banks are…I am not sure I will be able to shovel the driveway I we get more tho. It is lovely to walk in! 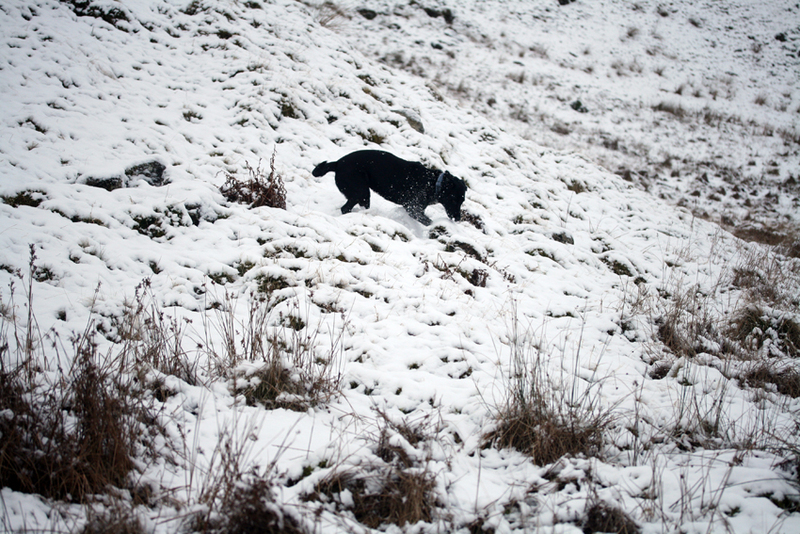 Thinking of you with the driving lesson-I bet Bruce loves the snow-such a joy to see dogs revelling in the white stuff! Best of luck and prayers for your lesson…. Have a great lesson…..you’ll be driving in no time! Beautiful photographs, thanks for sharing. All we’ve got is rain and more rain. Good luck for the driving lesson. I had an enforced break from driving following spinal surgery. Slowly but surely your confidence will return and you’ll be away. Good luck with the driving lesson tomorrow :) Bruce looks as though he’s enjoying himself. 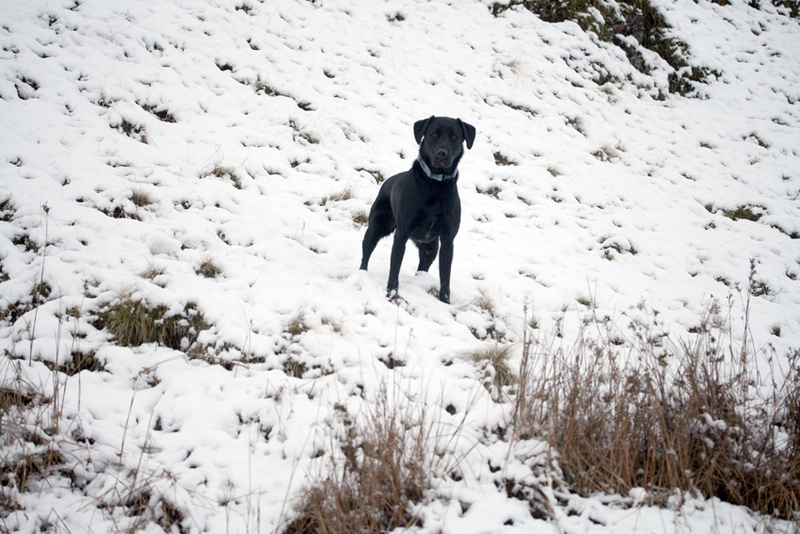 I’m not convinced that here in East Anglia we’ll be getting any snow this year, which will disappoint Jess (also a black lab). She doesn’t like being rained or snowed on, but once it’s on the ground, her head goes down and she ploughs through the snow and after a rain shower, she’s straight into any muddy puddle; the deeper, the better! For now though, she’s having a late morning nap on the sofa. Oh, you’ll be mobile again, what a lovely thought for you! Very nice pictures! Glad to hear someone else likes the snow. I like going out after a long day at work and getting that first few breaths of cold fresh air. It feels so good. Today it is predicted to be -29C. (Kitchener, Ontario Canada) Excellent weather for a scarf, hat and mitts, of course, all knitted. I am wearing my Sheepheid hat. I love it and get many compliments. Thanks for a great pattern! Good luck with the driving! Try to enjoy it. Relax and enjoy the lesson tomorrow and thanks for sharing Bruce with us today!! Wish we had some of that here! Water water everywhere and another months rainfall predicted this week. Gale force winds and my week old puppies have come into a wild wet world. Bruce looks so happy! Good Luck for the lesson tomorrow. I think we will have to build an ark down here in Surrey for all the poor displaced animals.